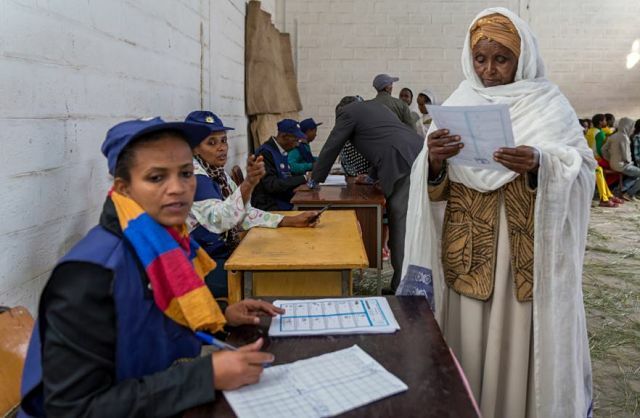 ADDIS ABABA, ETHIOPIA — Ethiopia’s ruling party won Sunday’s election with an overwhelming majority, according to preliminary results released by the country’s electoral commission. The electoral board says the ruling EPRDF party and its allies have won all the parliamentary seats decided so far – 442 out of 547. The Ethiopian Political Revolutionary Democratic Front won all of the seats in the capital city, Addis Ababa. Opposition parties only won a single parliamentary seat in the 2010 elections. It is not yet clear if they won more seats this time around, according to Merga Bekana of the electoral board. “Regarding the remaining results, we have to wait. According to our timetable we have time to gather, to collect and then publish it according to our schedule. But I cannot actually tell you actually how many remaining seats will be occupied by opposition or ruling party,” said Merga. Final results are expected on June 22. Leaders of the two largest opposition parties, Blue Party and Medrek, could not be immediately reached to comment on the preliminary results. Both have accused the government of harassing and intimidating their supporters before and during the elections. Ethiopia’s National Electoral Board said an equal platform was created for all political parties, and the government has denied accusations of obstructing the opposition in any manner. Merga said opposition parties should accept the reality, and said their accusations are baseless. The new parliament will convene in October, and EPRDF already has said that if the party wins again, Prime Minister Hailemariam Desalegn likely will be appointed to serve another five years in office. The EPRDF has been in power since ousting the regime of former dictator Mengistu Haile Mariam in 1991. The preliminary results came out one day before Ethiopia officially celebrates the downfall of the former regime.